Cheescakes supplier : Fresh handmade quality desserts for the catering trade. Cheesecakes date back to ancient Greece. Our cheesecake all come on a traditional butter digestive biscuit base and are made with our very own light and tangy cheesecake. We have an amazing variety of flavours and toppings, which are certain to delight your customers. Cheesecake swirled with dark chocolate and flavoured with orange and mandarins on a digestive biscuit base and finished with a brownie chunk. Caramel cheesecake topped with a Belgian chocolate mirror glaze and finished with Rolo's. White chocolate and lemon cheesecake on a digestive biscuit base topped with a handmade white chocolate and stem ginger truffle. Vanilla cheesecake mixed with crumbled sticky toffee pudding and garnished with toffee and a sticky toffee pudding cube on a digestive biscuit base. 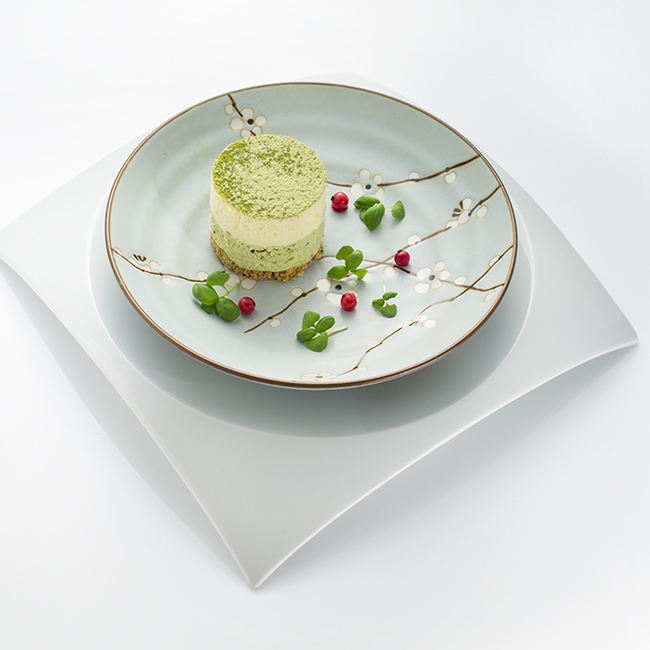 Biscuit base with a layer of matcha tea and chocolate chip cheesecake topped with an orange mousse, finished with matcha tea powder. Digestive biscuit base topped with cheesecake swirled with salted caramel. A rich creamy baked vanilla cheesecake flavoured with maple syrup and pecans on a biscuit base. Toffee and banana cheesecake piped onto a biscuit base decorated with banana chip. White chocolate and coconut mixed through our light cheesecake, set onto a digestive biscuit base and garnished with more white chocolate and coconut. Lime cheesecake swirled with white chocolate, piped onto a digestive biscuit base and garnished with lime zest and white chocolate curls. 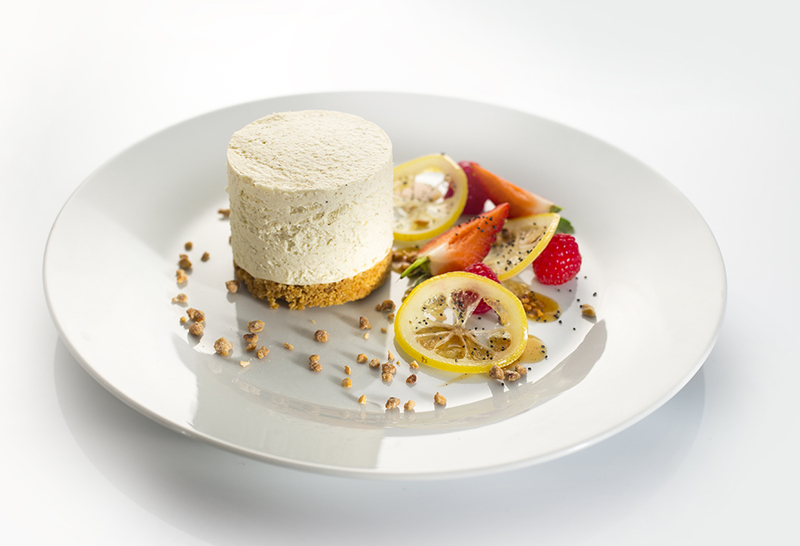 Our light unbaked cheesecake flavoured with vanilla seed on a butter digestive biscuit base. 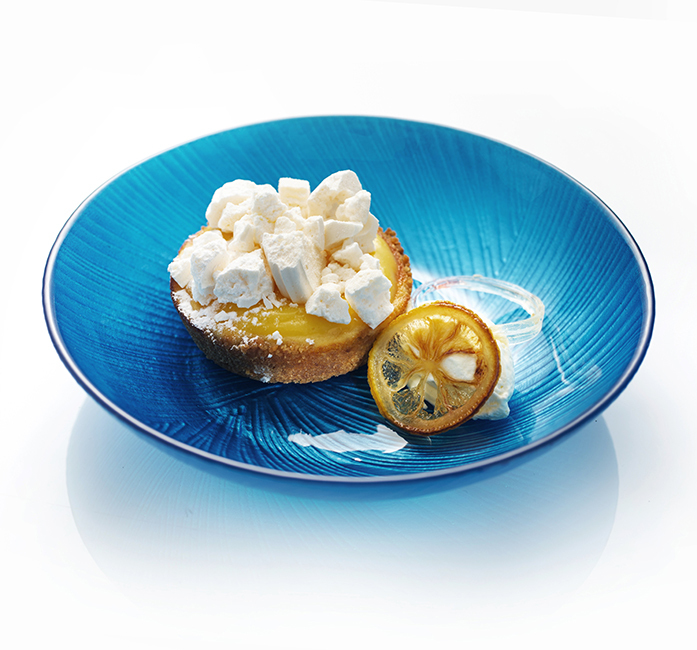 Baked cheesecake on a digestive biscuit base topped with a lemon curd and served with crushed meringue for topping. A rich creamy baked vanilla cheesecake on a biscuit base. 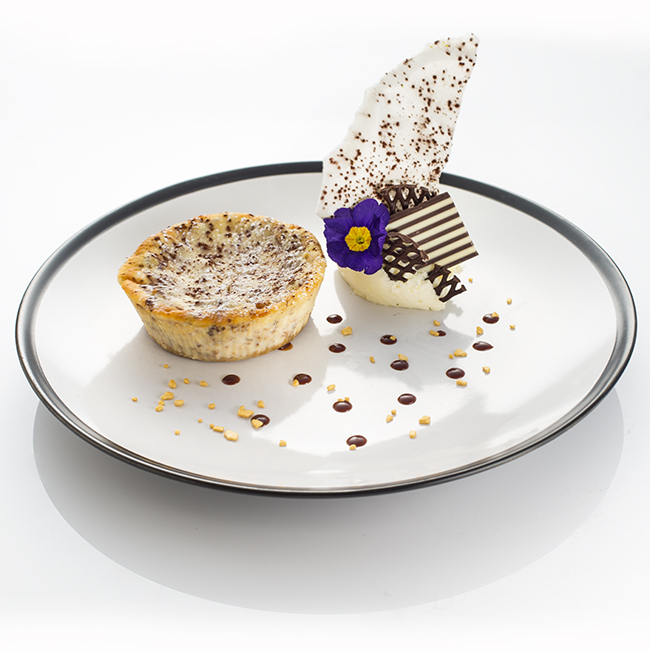 Rich creamy baked cheesecake rippled with apple and toffee, topped with an oat crumble. Chunks of chocolate brownie and raspberries mixed through our creamy cheesecake and baked on a biscuit base. 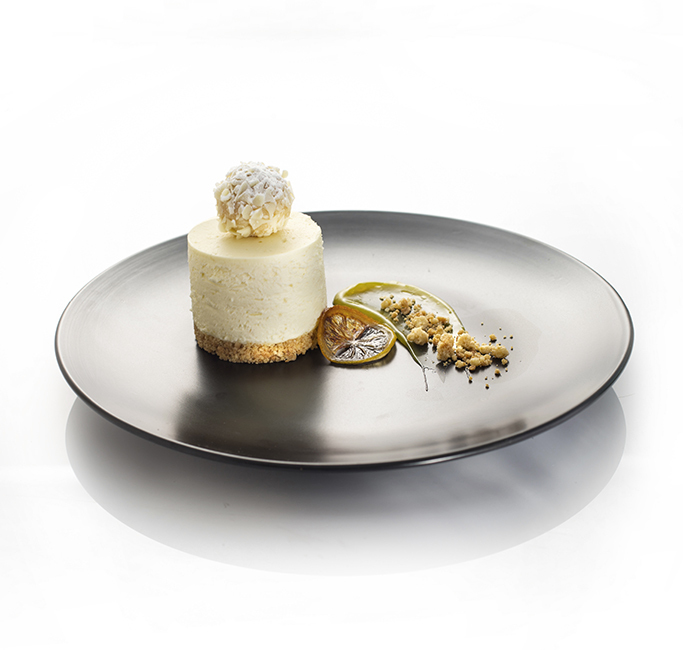 Lemon cheesecake swirled mixed with lemon curd, piped onto a digestive biscuit base and garnished with lemon zest. 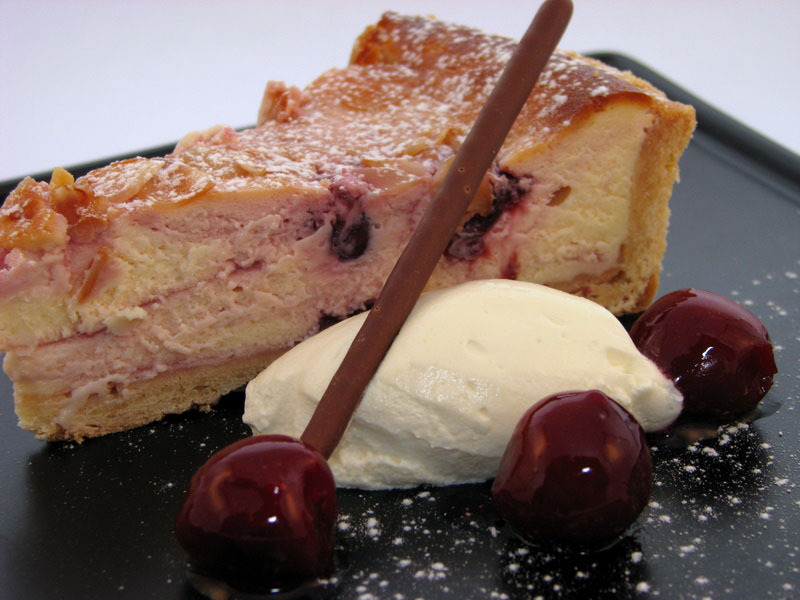 Digestive biscuit base with black cherries topped by a mascarpone cheesecake. Digestive biscuit base with our light cheesecake topped by blackcurrants set in a blackcurrant puree. Maple flavoured cheesecake mixed with crushed pecans piped onto a digestive biscuit base and garnished with chopped pecan nuts. Lemon cheesecake mixed with grated stem ginger and ginger syrup on a digestive biscuit base, garnished with stem ginger. Digestive biscuit base with our light cheesecake topped with a set butterscotch sauce. Cheesecake mixed with crushed cookies topping a digestive biscuit base and garnished with cookie quarters. Coconut cheesecake on a digestive biscuit base finished with set mango puree and shaved coconut. Digestive biscuit base with our light cheesecake topped with a set raspberry puree. Digestive biscuit base with our light cheesecake topped with a set strawberry puree. Honey flavoured cheesecake on a digestive biscuit base garnished with malteasers, white chocolate curls and chocolate chips. Rum soaked raisins mixed into our light cheesecake on a digestive biscuit base. Cheesecake mixed with Belgian chocolate ganache on a digestive biscuit base topped with a layer of chocolate ganache. White chocolate cheesecake on a digestive biscuit base garnished with a whole strawberry and set strawberry puree. Digestive biscuit base with our light cheesecake topped with forest berries set in a raspberry glaze. Light lemon cheesecake with two layers of carrot cake, topped with walnuts. White chocolate cheesecake piped onto a digestive biscuit base and finished with white chocolate curls. Cheesecake mixed with Belgian chocolate ganache and orange on a digestive biscuit base and finished with cocoa. Light cheesecake mixed with stem ginger and ginger syrup on a digestive biscuit base, garnished with pear quarters and chocolate chips. Toffee and chopped pecans mixed through our cheesecake on a digestive biscuit base and topped with pecan and cocoa, accompanied by a meringue disk. Digestive biscuit base topped with a raspberry and pistachio cheesecake, then decorated with raspberry puree and pistachios. Digestive biscuit base topped with an Irish cream cheesecake, finished with an Irish cream butterscotch. Layers of strawberry and blueberry cheesecakes topped with a raspberry glaze, on a butter digestive biscuit base. An orange cheesecake swirled with a ginger syrup and gingernuts on a biscuit base and garnished with gingernut crumb. Digestive biscuit base with our light cheesecake topped with redcurrants and set in a cherry puree. 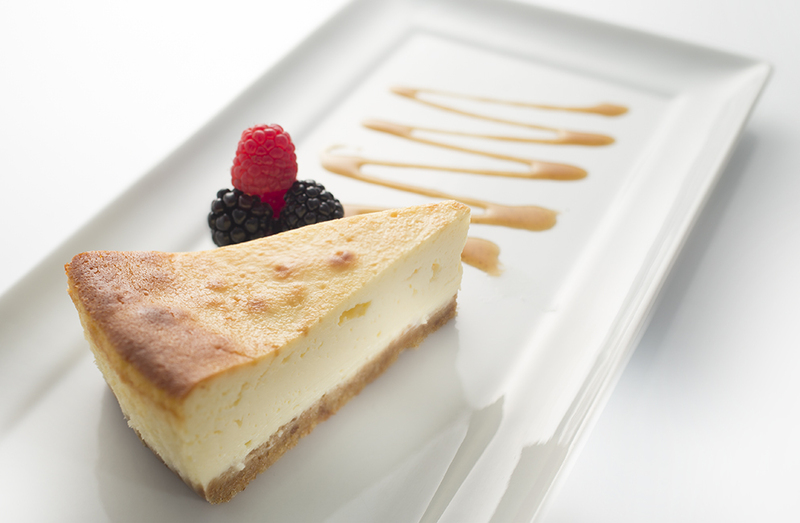 Our cheesecake is mixed with banana puree and honey and garnished with banana chips. Duo of white chocolate and dark chocolate cheesecakes piped side by side onto a digestive biscuit base and finished with chocolate curls. Our award winning cheesecake is made with Irish cream and Belgian chocolate ganache swirled through our light cheesecake, then piped onto a digestive biscuit base and finished with cocoa. 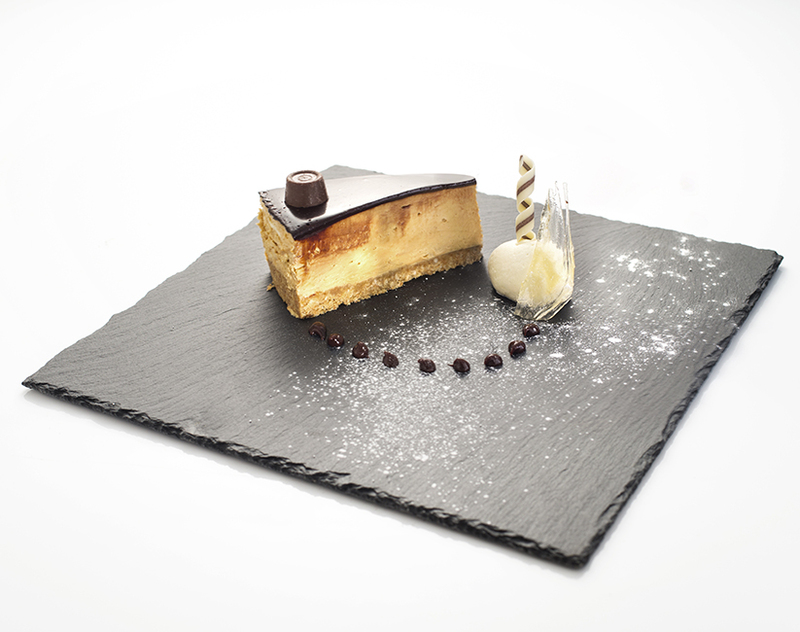 Digestive biscuit base topped with our cheesecake flavoured with Tia Maria and a coffee syrup and finished with a white and dark chocolate square.